A Free Data Recovery Tools contains a collection of DIY recovery tools that supports a wide variety drives and file systems. 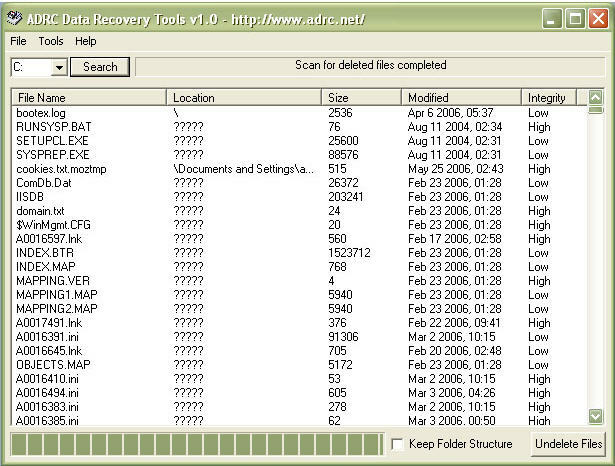 ADRC Data Recovery Software Tools contains a collection of DIY data recovery tools that supports a wide variety of drives and file systems. The software incorporates extremely simple GUI with novice users in mind. The software zooms in to do only critical recovery functions with minimum complexity so one could recover the data easily. It gives you full control to undelete files, disk image back up, restore a backup image, copy files from hard disk with bad sectors, disk cloning, backup, edit and restore your boot parameters. It is absolutely free! It is our pleasure to offer you the software without charge, direct or hidden, to download and use a fully functional copy of the program. The software will not install any spyware or adware. It does not gives pop-up ads or force any form of subscription to mailing lists. The program is designed to be compact "green-ware" without any installation. In fact, the whole program is less than 130 kb and you could stuff it anywhere (such as a floppy) and run the program from there to recover data. It gives you full control to undelete files, disk image back up, restore a backup image, copy files from hard disk with bad sectors, disk cloning, backup, edit and restore your boot parameters. Designed to be compact "green-ware" without any installation.